The main objective of this study was to find out if the parasitic fly Philornis downsi, which is an invasive species accidentally introduced into the Galápagos Islands, occurs naturally on mainland Ecuador. In order to do this, we needed to observe bird nests after the birds finished rearing chicks and abandoned it. 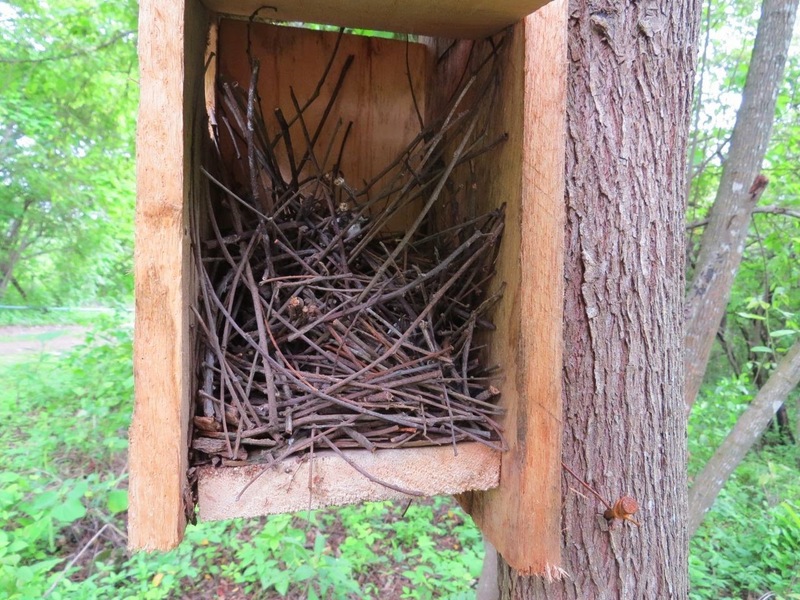 An easy, well-established method to follow bird reproductive behavior consists of installing wooden nest boxes with a side door that can be opened and the inside nest (and bird activities) easily monitored. The Bosque Protector Cerro Blanco is the perfect place for this study given its high bird diversity. Nest box set in the trunk of a tree in Cerro Blanco with a Streak-headed Woodcreeper standing on it. 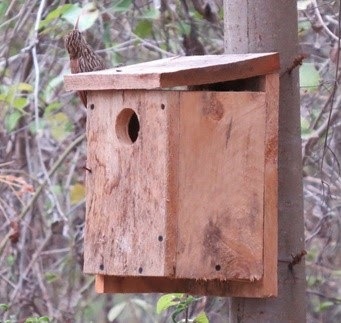 On November 2013, a team of biologists from the University of Minnesota (USA), Universidad Nacional del Litoral (Argentina) and Universidad de Guayaquil (Ecuador) installed a total of 158 nest boxes inside the perimeter of the Bosque Protector Cerro Blanco. Between January and June 2014, the nest boxes were monitored weekly in search of any sign of bird activity (nest construction, incubation, tending to the chicks, etc.). Many of the boxes were not occupied, as is normal during the first year in most studies. It takes time for the birds to get used to the presence of the nest boxes and actually use them. In some cases, nests were constructed inside the boxes but they were abandoned. In only four nest boxes, birds laid eggs and fledged chicks. Nest constructed inside a nest box. 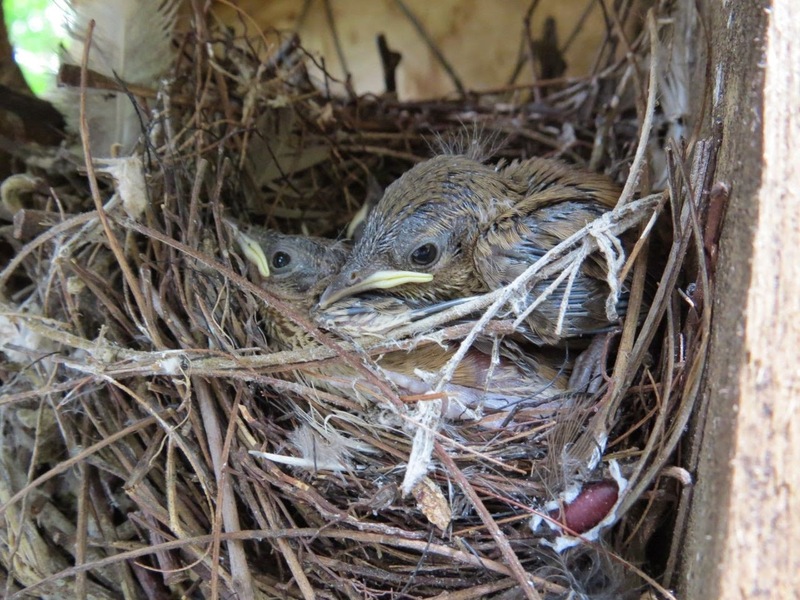 On March 1st 2014, we found five House Wren (Troglodytes aedon)’s eggs in a nest box. Five nestlings hatched but only three nestlings remained on March 22nd, they fledged on March 29th. We found 8 Philornis pupae in the nesting material. After examination under the microscope in the laboratory, we confirmed the presence of Philornis downsi in mainland Ecuador. Our study recorded two new host species for the genus Philornis: the Fasciated Wren (Campylorhynchus fasciatus), a common species restricted to western Ecuador and northwest Peru where it principally inhabits arid and semi-arid habitats; and the Streak-headed Woodcreeper (Lepidocolaptes souleyetii), a furnariid found in Central and Northern South America. Our data indicate that Philornis downsi occurs naturally on mainland Ecuador and is relatively abundant in the vicinity of Guayaquil. Cerro Blanco is located approximately 15 km from the Guayaquil airport and 20 km from the Guayaquil harbor. These data support the hypothesis that P. downsi could have been introduced to the Galápagos from mainland Ecuador.